Our new inverter is now directly wired to the boat's electrical panel. This means we have 120 volt electricity through out the boat at all times. We have three very large (160 lbs each) "8D" batteries giving over 500 amp hours of electricity. Those run quite a lot of the items on the boat at 12 volts. Then the electricity flows to our inverter/charger which sends 120 volts to the 120 breaker panel, and from there to the outlets. 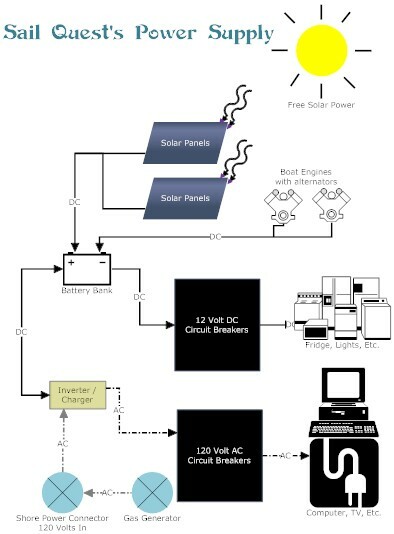 The solar panels charge the batteries all day, and if we have the engines running they also send power to the batteries. If that isn't enough (maybe it's been cloudy for a few days), then we can start up our gas generator that charges the batteries up in a couple of hours. When we are at a dock, we can plug in to "shore power" and it will charge the batteries and power the items on the boat.